Greetings Divas! The following post is one that I've been thinking about for a little while. A few months back, I started thinking about those characteristics that are not ideal in the office environment. More specifically, I tried to isolate specific types of individuals who are toxic to the workplace, and who can make your work environment more stressful and less productive. In considering these individuals, I started doing some self-reflection. By no stretch of the imagination am I the perfect professional, and I am certainly capable of improving in many areas...no one is above self-improvement. I started looking at instances when I was not at my best; when I was not as productive as I should be in the office. Instances when I was downright raggedy! Once I isolated those instances, and pulled the characteristics that I was exhibiting in those moments. And that, folks, is how I came up with this list of the 4 types of people one does not want to be in the office. Take a look, and be honest with yourself...have you, at some point in your career, been any of these people? If so, how did you check yourself? 1. The Negaholic - The Negaholic is the most toxic individual in the office. This is the person who turns any and every thing into something negative. The Negaholic always thinks the glass is half empty, and then works overtime to convince everyone to join in her pessimism. The Negaholic complains about everything, and never sees the good in anything. I once worked with a classic Negaholic, so I know from experience how toxic this individual is to an office and to a team. Trust me when I tell you...you do not want to be her! 2. The Slacker - This rule is simple. If your entire team is swamped, you should be swamped as well. It's the classic teamwork model. When the team is in the trenches and trying to complete a task, it's all hands on deck. Simply put, if everyone else on your team is working late every day for a week, you should also be working late. This may seem like an arduous notion for those of us with other pressing responsibilities. If this is the case, be sure to communicate your other obligations to your team. 3. The Gossip - There's at least one in every office environment...and you know exactly who she is! She's the one who is seemingly always standing around the coffee station, or the restroom, or at someone's desk with a fresh slate of gossip to share with anyone who will listen. This person does not typically care whether the gossip is true or not, but she is happy to forego a productive work day to spread said gossip around. Needless to say, the Gossip is not a productive member of the team and is possibly the source of a lot of angst that may creep into the office. Don't be the messy gossip...no one really likes her! 4. The Chatterbox - One of the most irritating individuals to work with is the Chatterbox. The Chatterbox is especially irritating when there's a lot of work to do. Think about it for a second. You are at your desk working hard on a project with an approaching deadline, and the Chatterbox shows up at your desk to talk about anything and everything but work. The next thing you know, twenty minutes have gone by and you are no closer to getting your project done. 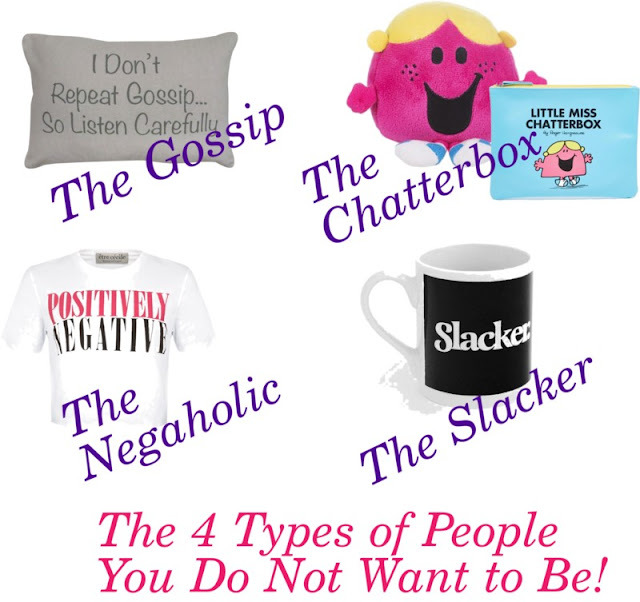 Although the Chatterbox may be friendly and generally means well, she is a distraction. The last thing you want to be is a distraction, as distractions are dispensable.